You don't need to be an expert in cinema to see that practically every studio in town is vying for their own cinematic universe like Marvel Studios is building. Even Universal, who doesn't own any major superhero properties, is getting into the shared universe game by using their classic monster movie catalog. Other studios have also copied a quirky trait popularized by Marvel Studios: revealing release dates before the titles. 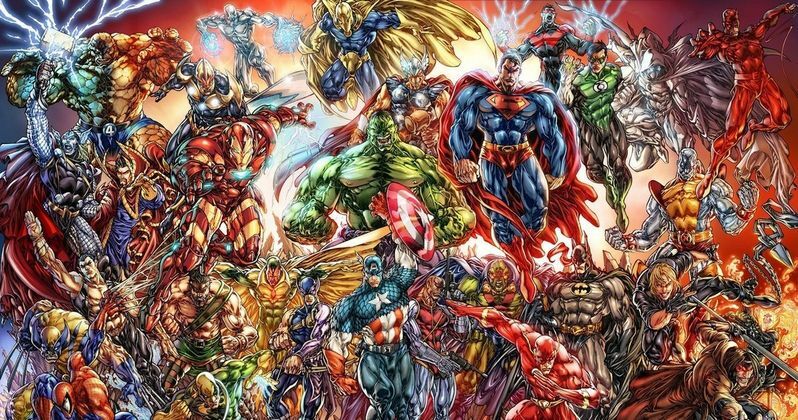 Last month, Marvel announced five release dates for unspecified movies through 2019, leading to Warner Bros./DC following suit by announcing nine superhero release dates earlier this week, that goes all the way up until the year 2020. Between all of these releases, and the movies we actually know are coming, there are a total of 30 superhero films scheduled to hit theaters between 2015 and 2020, and that's not even counting sequels to these movies which could be slotted in anytime between now and then, or other projects in development. For now, let's take a look at the 30 confirmed movies/release dates from 2015 to 2020, from Marvel Studios, Warner Bros./DC, 20th Century Fox/Marvel and Sony Pictures/Marvel, and some of the speculated titles for the blank release dates. UPDATE: (10/17/14) This story has been updated to reflect the announcement of Warner Bros./DC Comics full movie slate, along with Fox's Deadpool. First off, the only two projects/dates on this list that haven't been confirmed are Sony's Venom Carnage and the Untitled Spider-Man Female Character spin-off, which we reported last week were both being eyed for 2017. In addition, there are still three more Sony/Spider-Man movies that have not been given release dates, and it's possible that even more spin-offs will be announced between now and then. On top of all that, Marvel still hasn't announced any films for 2020 yet, and just one for 2019, so that will add another five movies to this growing slate as well, if Marvel keeps up their projected trend of putting out three movies per year. And, if The Fantastic Four and The Fantastic Four 2 are successful in 2015 and 2017, there could easily be a third Fantastic Four movie in 2019, along with the long-gestating Deadpool, X-Force and Gambit starring Channing Tatum, all of which are currently in development and could very likely be given release dates between 2015 and 2020. If you count the 30 confirmed movies/release dates, plus the others mentioned above, that brings the total up to 41 superhero movies that could be released between 2015 and 2020. Naturally, this could, and likely will, all change in the days, weeks and years to come, as studio slates keep shifting rapidly. Do you think 40 superhero movies in 6 years is going overboard? Or do you want there to be more? What are your best guesses for the slew of unspecified release dates from Marvel Studios, Warner Bros., 20th Century Fox and Sony Pictures? Chime in with your thoughts below.